Dec 26-31, 2018 Mr. Gourav B.A.III (1611415) Represented India for Copper Box International Handball Cup held at Copper Box Olympic arena, London. Gold Medal in District Khel Mahakumbh held at G.M.N., Ambala Cantt. Mr. Gourav B.A.III (1611415) Participated in All India Invitation Handball Championship held at Chandigarh. Nov.02-05, 2018 Ms. Bhawna B.A.III (1611415) Participated in 3rd Asian Women’s Club League Championship held at Almaty, Kajakhstan. Gold Medal in K.U. 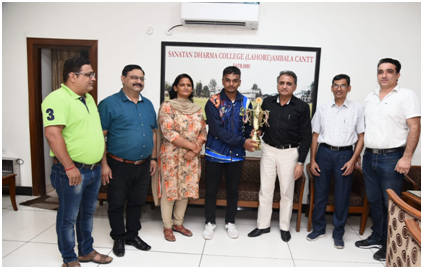 Zonal Tournaments held at S. D. College, Ambala Cantt. Bronze Medal in K.U. 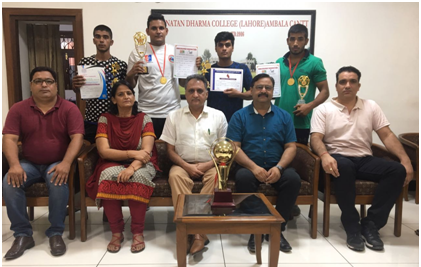 Inter- Zonal Tournaments held at S. D. College, Ambala Cantt. Five players selected for North Zone Inter University Camp. Gold Medal in District Khel Mahakumbh held at Khalsa School, Ambala Cantt. Jan 2-4, 2019 Mr. Kapil Dahiya B.A.-I (2383910015) Won Gold Medal in Senior All India Open National Championship held at Dadri, Haryana. Mr. Rohit B.A.-I (2383910035) Won Gold Medal in Senior All India Open National Championship held at Dadri, Haryana. Mr. Nikhil Malik B.A.-I (2383910034) Won Silver Medal in National Boxing Championship held at Punjab. Mr. Manjeet B.A.-I (2383910018) Won Gold Medal in State Sports & Physical Fitness Championship held at Gurugram, Haryana. Mr. Aniket Mann B.A.-I (2383910019) Won Bronze Medal in Haryana State Boxing Championship held at Dadri, Haryana. Mr. Rohit Won Silver Medal, Kapil Dahiya, Rahul, Vishal, Jatin Vaish and Arshad Participated in 4th (DGHE) Inter Collegiate State Boxing Championship (M & W) held at Govt. College Bhuna, Fatehabad, (Haryana). Mr. Amit B.A.-I (2383910013), Kapil Dahiya B.A.-I (2383910015), Vishal B.A.-I (2383910036) and Jatin Vaish B.A.-I (2383910047) Won Bronze Medal in K.U.K. Inter Collegiate Boxing Championship held at Sports Complex Kurukshetra University, (Haryana). Mr. Nikhal Malik B.A.-I (2383910034), Rahul B.A.-I (2383910004), Arshad B.A.-I (2383910050) Parcipated in K.U.K. Inter Collegiate Boxing Championship held at Sports Complex Kurukshetra University, (Haryana). Jan 10-13, 2019 Ms. Anjali B.A.-I (2383920014) Won Gold Medal in 11th Junior Women National Boxing Championship held at Jhajjar, Haryana. Ms. Aarti B.A.-I (2383920011) Won Bronze Medal in 18th Senior National Women Boxing Championship held at Roorkee (Uttarakhand). Ms. Neetu B.A.-I (2383920015) Participated in 11th Junior Women National Boxing Championship held at Jhajjar, Haryana. Ms. Aarti B.A.-I (2383920011) Won Gold Medal in 17th Senior State Women Boxing Championship held at Gurugram (Haryana). Ms. Siwi M.A.-I (2294820007) Won Gold Medal in K.U.K. Inter Collegiate Boxing Championship held at Sports Complex, Kurukshetra University (Haryana). Ms. Kirti B.A.-I (2383920012) Won Gold Medal in K.U.K. Inter Collegiate Boxing Championship held at Sports Complex, Kurukshetra University (Haryana). Ms. Aarti B.A.-I (2383920011) Won Gold Medal in K.U.K. Inter Collegiate Boxing Championship held at Sports Complex, Kurukshetra University (Haryana). Ms. Neetu B.A.-I (2383920015) Won Gold Medal in K.U.K. Inter Collegiate Boxing Championship held at Sports Complex, Kurukshetra University (Haryana). Ms. Anjali B.A.-I (2383920014) Won Gold Medal in K.U.K. Inter Collegiate Boxing Championship held at Sports Complex, Kurukshetra University (Haryana). Ms. Savita B.Com-I (2368620006) Won Gold Medal in K.U.K. Inter Collegiate Boxing Championship held at Sports Complex, Kurukshetra University (Haryana). 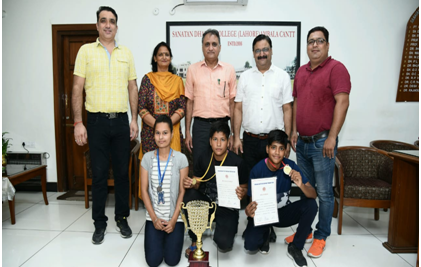 Mr. Sahil Solanki B.A.-I (2383910030) Participated in 11 Sports National Ranking (North Zone) Championship-2018 held at Panchkula, Haryana. Mr. Sahil Solanki B.A.-I (2383910030) Participated in 11 Sports National Ranking (Central Zone) Championship-2018 held at Indore, Madhya Pradesh. Mr. Sahil Solanki B.A.-I (2383910030) Participated in 48th All-India Inter –Institutional Championship held at Coimbatore. Mr. Sahil Solanki B.A.-I (2383910030) Participated in 11 Sports National Ranking (South Zone) Championship-2018 held at Vijayawada, Andhra Pradesh. Mr. Sahil Solanki B.A.-I (2383910030) Won Bronze Medal in Haryana State Table Tennis Championship held at Sonipat. Gold Medal in K.U. Zonal Tournament held at S. D. College, Ambala Cantt. Oct 16, 2018 Mr. Anuj B.A.-I (2383910046) Won Gold Medal (Shot Put) and breaking University Record (16.50 mt) in K.U. Inter-College Tournament held at K.U. Sports Complex. Mr. Anuj B.A.-I (2383910046) 5th Position (Shot Put 16.70mt) in All India Inter University held at Manglore University. Mr. Amarpreet Singh B.A.-II (1651010060) Won Gold Medal (10000 mt, 5000 mtr. ), Silver Medal (1500 mt.) in K.U. Inter-College Tournament held at K.U. Sports Complex. Mr. Sachin Kumar B.A.-II (1651010002) Won Silver Medal 5000 mt. Race Bronze Medal (1500 mt.) in K.U. Inter-College Tournament held at K.U. Sports Complex. Mr. Sachin Kumar B.A.-II (1651010056) 4th Position (Half Marathon) in K.U. Inter-College Tournament held at K.U. Sports Complex. Mr. Lakhveer B.A.-I (2383910022) 5th Position (Half Marathon) in K.U. Inter-College Tournament held at K.U. Sports Complex. Mr. Sachin Kumar B.A.-II (1651010002) Won Bronze Medal (3000 mt. Stepple Chase) and Bronze Medal (5000 mt. Race) in Haryana State Senior Athletics Championship – 2018 held at Panchkula. Mr. Sachin Kumar B.A.-II (1651010002) Won Bronze Medal 5000 mt. Race in Haryana State Junior Athletics Championship held at Rajiv Gandhi Stadium Rohtak. Mr. Amarpreet Singh Won Gold Medal (5000 mtr. ), Silver Medal (1500 mtr) and Bronze Medal (Relay) in District Khel Mahakumbh held at Rajiv Ghandhi Stadium, Ambala City. Mr. Sachin Kumar Won Silver Medal (5000 mtr. ), Gold Medal (1500 mtr) and Silver Medal (Relay) in District Khel Mahakumbh held at Rajiv Ghandhi Stadium, Ambala City. Mr. Ajay Kumar Won Bronze Medal (10000 mtr.) and Silver Medal (400 mt hurdle) in District Khel Mahakumbh held at Rajiv Ghandhi Stadium, Ambala City. Mr. Ravi Kumar Won Bronze Medal (400 mt) in District Khel Mahakumbh held at Rajiv Ghandhi Stadium, Ambala City. Oct 15-17, 2018 Ms. Sapna B.A.-I (2383920005) 4th Position in 10000mt. Race in K.U. Inter-College Tournament held at K.U. Sports Complex. Ms Bhawna B.A.-III (1611007) Won Silver Medal (400 mt Hurdal Race) in District Khel Mahakumbh held at Rajiv Ghandhi Stadium, Ambala City. Ms. Sapna B.A.-I (2383920005) Won Bronze Medal (400 mt Hurdal Race) in District Khel Mahakumbh held at Rajiv Ghandhi Stadium, Ambala City. 2018Oct 20-21, 2018 Mr. Sahil Yadav Participation in All-India Inter University Championship held at Punjab University, Chandigarh. Overall Team 4th Position. Mr. Sahil Yadav B.A.-II (1651010044) Won Gold Medal in K.U. Inter-College Tournament (Individual Floor Exercises) Gold Medal in Vol. Table and Won Silver Medal in Horizontal Bar held at K.U. Sports Complex. All Round 2nd Best in Individual in Kurukshetra University. Overall 4th Position in K.U. 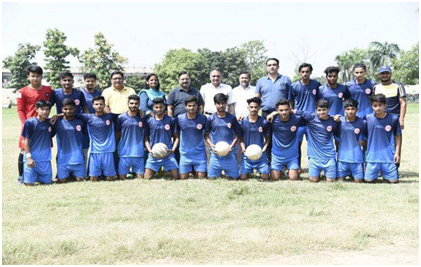 Inter-College Tournament (Team Position) held at K.U. Sports Complex. Ms. Aarti Devi B.A.-I (2383920013) Won Silver Medal in Federation Cup Taekwondo Championship 2018 held at Jammu, J & K.
Mr. Sarjan Kumar B.A.-I (2383920013) Won Bronze Medal in Federation Cup Taekwondo Championship 2018 held at Jammu, J & K.
Mr. Sarjan Kumar B.A.-I (2383920013) Gold Medal in 38th National Junior Poomsae Taekwondo Championship 2018 held at Karnataka. Mr. Sarjan Kumar B.A.-I (2383920013) Gold Medal in 11th National Junior Kyorugi Taekwondo Championship 2018 held at Karnataka. Mr. Manpreet B.A.-II (1651010042) Gold Medal in 9TH Haryana State Senior Poomsae Taekwondo Championship 2018 held at Gurgaon (Haryana). Oct 20, 2018 Gold Medal in K.U. Zonal Tournament held at S. D. College, Ambala Cantt. Gold Medal in K.U. Inter-Zonal Tournament held at G.N. Khalsa College, Yamuna Nagar. Sept 19-21, 2018 Gold Medal in K.U. Zonal Tournament held at S. D. College, Ambala Cantt. Bronze Medal in K.U. Inter- Zonal Tournament held at Kurushetra University, Kurukshetra. Three players Selected for North Zone Inter University Camp. Sept 26-27, 2018 Gold Medal in K.U. 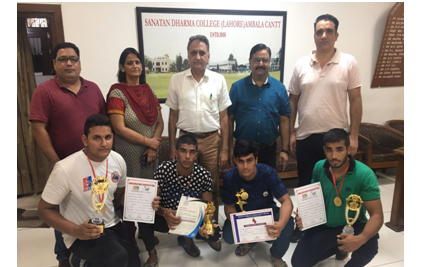 Zonal Tournaments held at S.D.College, Ambala Cantt. Oct 28-29, 2018 Gold Medal in K.U. Zonal Tournaments held at S. D. College, Ambala Cantt. Oct 15-17 , 2018 Gold Medal in K.U. Zonal Tournaments held at S. D. College, Ambala Cantt. Silver Medal in K.U. Inter- Zonal Tournaments held at Arya PG College, Panipat, (Haryana). Ms. Rimpy Devi B.C.A.II (1631120008) and Ms. Ankita Kashyap B.Com.III (1612004) Participation in North Zone Inter University Championship held at Amity University, Noida. 17. Chess (Men) Oct 19, 2018 Participated in K.U. Zonal Inter-College Tournament held at D.A.V. College, Ambala City. 18. Basketball (Men) Sept 27, 2018 Silver Medal in K.U. Zonal Tournament held at Sports Complex, Kurushetra University, Kurukshetra. 19. Wrestling (Men) Oct 3-4, 2018 Mr. Ritik B.A.-I (2383910028) Won Silver Medal and Mr. Bintu B.A.-I (2294110223) Participated in K.U. Inter-College Tournament held at Sports Complex K.U. K.
20. Cricket (Women) Oct 11, 2018 Ms. Nisha, Diksha Gupta, Nishu, Diksha Participated in North Zone Inter University Championship held at M.D.U, Rohtak, (Haryana). 21. Cricket (Men) Participated in K.U. Zonal Inter-College Tournament held at D.A.V. College, Pehwa and RKSD College Kaithal. 22. Kabaddi (Men) Sept 22-23, 2018 Participated in K.U. Inter College Tournament held at S.A. Jain College, Ambala City, Haryana. 23. Swimming (Men) Oct 19-20, 2018 Mr. Vaibhav Chaudhary B.A.-I (2383910032) Participated in K.U. Inter College Tournament held at Sports Complex K.U. K.
Relay Team Participated in K.U. Inter College Tournament held at Sports Complex K.U. K.
24. Water Polo (Men) Oct 19-20, 2018 Participated in K.U. Inter College Tournament held at Sports Complex K.U. K.
Organised National Cricket (Men) Tournament for the Blind on 30 Nov. to 02 Sept, 2018. 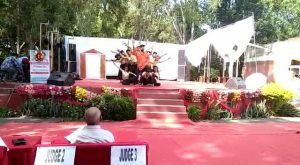 Organised First Sanskrit Shaastra Based Sports Fest-2018 on 29 Sept, 2018. Organised District (Men and Women) Boxing Championship Tournament on 7-8 July, 2018. Organised K.U. Zonal Football (Men) Tournament on 17-18 Sept, 2018. Organised K.U. Zonal Cricket (Women) Tournament on 22-23 Sept, 2018. Organised K.U. Zonal Badimintion (Men) Tournament on 24-25 Sept, 2018. Organised K.U. Zonal Chess (Women) Tournament on Oct. 03, 2018. Organised K.U. Zonal Chess (Men) Tournament on Oct. 19, 2018. Organised K.U. Zonal and Inter Zonal Handball (Women) Tournament on Oct. 11-12-13, 2018. Organised K.U. Zonal Badminton (Women) Tournament on Oct. 26-27, 2018. Organised K.U. Zonal and Inter Zonal Table Tennis (Women) Tournament on Oct. 19, 2018. Organised K.U. Zonal and Inter-Zonal Table Tennis (Men) Tournament on Oct. 26-27-28, 2018. College Boxing (Women) Players Ms. Anjali Won Gold Medal and Ms. Neetu Participated in 11th Junior Women National Boxing Championship held at Jhajjar, Haryana. 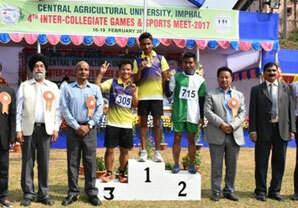 College Football (Men) Team Won Gold Medal in K.U. Zonal Tournament and Bronze Medal in K.U. Inter- Zonal Tournament held at Kurushetra University, Kurukshetra.